Sorry about the delay in answering.. As I was writing up the answer, I noticed a bug and needed to let some folks know about it. But back to our problem--what was Larry Page's first patent? However, it seems that the Advanced Search function on Patents is currently not working correctly. Because my answer WOULD have been, SHOULD have been: Use Google Patents, use the Advanced Search interface and search for inventor "Lawrence Page" (because people typically use the full form of their name, rather than the diminutive). But what does it mean to be a skilled searcher if you can't work your way around it? So, using just the regular Google Patent search page, you can enter [ Lawrence Page ] and sort by date. That's not hard, but it is a bit painful to sift through all of the non-Google-related patents. You could even try quoting his name, "Lawrence Page" but even that won't help much. Another approach (and what I actually did) would be to go directly to the US Patent Office web site (USPTO.gov) and use their advanced search UI. Note that their's is a bit more baroque than Google's (for instance, you have to do the search [ IN/Lawrence AND IN/Page ] in their system). The good property of searching the USPTO is that you'll find only 12 hits on "Lawrence Page," so it's simple to figure out which one was first. From USPTO, then, the answer is US Patent: 6,285,999 granted on September 21, 2001. "Method for node ranking in a linked database." Sometimes you think a problem is going to be dead easy, and it turns out to be more complicated than you'd expect. For instance, here's today's challenge... "What was the title of Larry Page's first patent?" You'd think this would be simple and straightforward. (And maybe you'll find a simple way to answer this.) But the way I did it was a little more complex than I thought it should be. Over the past weekend I was doing an obvious search, and not having ANY luck whatsoever. What was going ON? In my case, I was just trying to look up what had happened in Ethiopia during the Jazz Age (roughly 1910 - 1920, don't ask why.. it's a long story). But I was having very little luck. It was as though all records of Ethiopia had vanished for dates before 1930. And then I read the Wikipedia article on Ethiopia (trying to read a little history about the country as general background).... and noticed a really interesting thing. Ethiopia used to be called Abyssinia! Armed with this knowledge, I popped back to my Google News Archive search and found many references to Abyssinia that predate 1930. Voila! And after thinking about it, I realized this must happen a lot with historic searches. Consider the following list of "retro terms" I found on the HWWilson site. What terms do YOU find have undergone a significant change? Any experiences from readers? It's been a busy week. 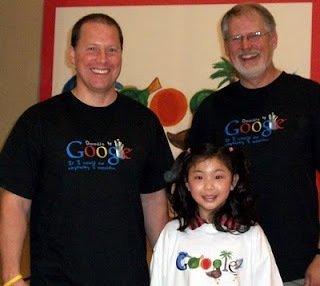 This week I ended up presenting at two elementary school assemblies--the first to 700 kids about Doodle 4 Google, and the second to 350 kids on the topic "Curiosity Tools for Curious Students"--all about Google, with plenty of demonstrations. Here's Chris Haas (my co-presenter, on the left), me and Kathy Lee--the 4th grade winner of the Doodle-for-Google content in her greater Minnesota region. One of the important things I tell the students is this: You've got to keep checking back to see what's new at Google, because we're always making new tools and new capabilities available. 3. Learn about the different Google search properties. Everyone knows that Google lets you search the web, and most people know that Google lets you search for images and videos. But did you know that Google also lets you search through the collected news archives going back to the mid 1800s? And you can use Google to search for scanned copies of books and magazines (books.Google.com), financial information about companies you care about (www.Google.com/finance), scholarly articles from scientific journals and conferences (www.Google.com/scholar), and blogs (blogsearch.Google.com). For instance, last week Google launched 5 new languages on Google Translate — Armenian,Azerbaijani, Basque, Georgian and Urdu. Google also extended their support for spoken translations to 29 more languages. If you blink, you might miss an important announcement that's really relevant to the kinds of work you do! 4. Use short, simple queries that get to the point. is not a great query. The key thing you want to search out is information about the bird. All the extra words about “I saw at” or “last Tuesday afternoon” just aren’t relevant. Worse than that, all those extra words actually decrease the accuracy of the search results. Keep your search queries crisp and to the point. We'll talk about how to explore a query space in a few more posts. But for the moment, keep your queries tight and on-target. and—voila!—there you go, you’ve found the Purple Moorhen. Now if you Google bird’s name [ Purple Moorhen ], you can learn its scientific Latin name (Porphyrio porphyrio), that they range from India to Australia and Africa, and that the state of Florida is trying to eradicate their accidentally introduced population. But it’s worth knowing that most Google searchers can, with just a bit more inside information, can become really super searchers. When I teach classes on how to search with Google, there are the top few key ideas that make people much faster in their searches, and able to discover things they never knew existed. 1. Find a word on the page. Ever do a search and then discover that you’re on a very long web page with no idea where your search terms are? This happens fairly often, and the most important skill to have is the ability to find a word on the page. As it happens, your internet browser has this ability already built-in. Just look for the Edit menu at the top of the internet window. Click on it and you’ll see the submenu item labeled “Find.” If you click on that, you’ll see a small window that let’s you search for any word on the page. This is a lifesaver when ou’re searching for a particular word and it’s found only on the 10th screen down. 2. Install the Google Toolbar to speed up your searching. (Click here to find out how to install the Toolbar) Google offers a free toolbar for all the different internet browsers. The Toolbar lets you do a plethora of things to help you search, including bookmarking good web pages that you find, translating terms you see on the page, spell-checking, and instant searching on other Google properties (like Google Books, Google Maps, Google News, etc.). But the one Google Toolbar feature that is very useful to power users is the highlight button. 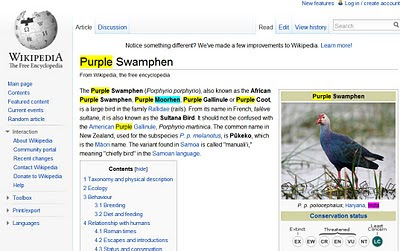 If you do a search on Google and end up on a page (say, the Wikipedia page about Purple Moorhens), when you click on the highlighter button, it will highlight all the appearances of your search terms on that page. 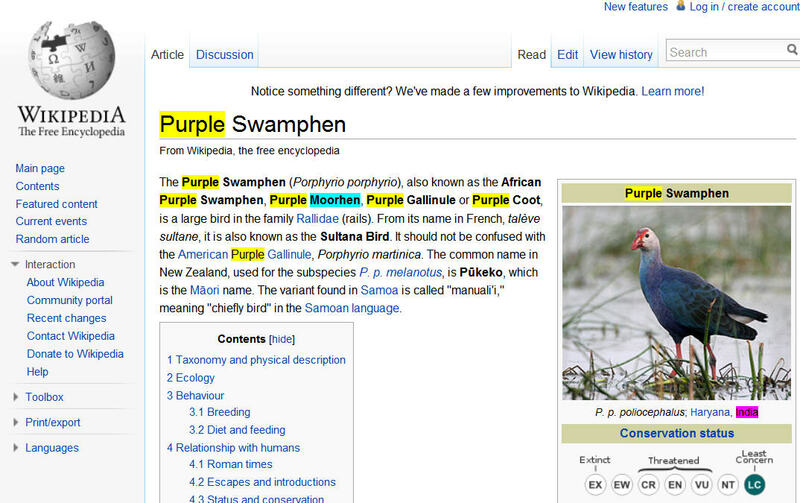 So if you’ve searched for [ purple moorhen India ] and gone to the Wikipedia page, clicking the highlighter will highlight all three of those words in different, highly visible colors. This is a real timesaver for pages with small fonts or long, complex articles. Check out the results as shown here on the Wikipedia page... Note the yellow, blue and purple highlights. You can quickly spot ALL of your search terms on the page. Next week... a few more tips! How should one approach a search question like this? Answer: Once you realize that the name "Dan Russell" is very, very common (what where my parents thinking in giving me such a high frequency name? ), you'll need to start the search with a little care because there are bound to be lots of false hits. You can see this right away from the obvious query: [ Dan Russell nytimes.com ] There are just too many "other" (and obviously incorrect!) Dan Russells in the news. People often have a "professional" name that they use. That is, scholars (and people who are slightly savvy about marketing) like to have a single nom de professional that is the same everywhere. That way, when someone does a search for the papers and articles you've written, they all show up in the same place in the index. This practice pre-dates the web by a lot. Authors often want all their publications to be found at the same place in the library stacks and in the same location in the accumulated index of articles. Does anyone else remember the "Reader's Guide to Periodical Literature" published by the H. W. Wilson company? It was the way you found articles pre-web-search. It was a giant set of books that indexes magazines and journals by author's name and article subject. To use the Reader's Guide, you'd look up "Russell, Daniel M." to get to all of my articles. try searching their professional / canonical name. [ Daniel M Russell site:nytimes.com ] -- this starts to look much better. Now, having said all that, you should know that reporters also sometimes get it wrong, which means you still have to check name variants. So now where are we? We have to try name variants ("Dan Russell" "Daniel M Russell" and "Daniel Russell") and we'll use site:nytimes.com. But if you've been trying these queries out, you'll see that my name is STILL too common. We need to add something else to the query to cut down on all of the other, obviously bogus Dan Russells in the results! The simplest tactic at this point is to ADD a term (a "context term") that would discriminate the Dan Russells from each other. Often a good filter is the place of employment. In my case, that history includes Google and IBM. So let's try adding in "IBM" as a context term. If we try adding "IBM" then you'll see that results get much better. Now, the top 4 hits are all exactly what we're looking for. And, as you'll see (and just as David said), I've appeared 4 times in the NYTimes. 1. Use the SITE: operator to limit your search to just the newspaper of interest. 3. Search for a person's professional name (if they have one--many academics, writers and reporters do). 4. Remember to search for earlier variants of a name. Women (and on occasion, men) will sometimes change their surname upon marriage. Often the best way to discover earlier variants of a name is to look for their home web page or for parenthetical comments in their writings. Look for things like Susan Smith (nee Kline) for clues to other names. 5. Look for a "context term" that is associated with the particular person you're searching for. In the case of Dan Russell, that "context term" is IBM. It's just another word that's used in association with the person you seek (and NOT associated with all the other people with the same name). Now, this time, the search is much closer to home. This question, like many of the challenges, started out with someone telling me something just a bit funny, and then I run off and try to track it down. This time one of my friends said "You know, I saw that you were quoted in the New York Times! You must be famous!" Well, I'm not sure the two statements go together, but when I looked I found it was true. A few years ago I WAS quoted in the New York Times. As a Search Challenge, though, finding it proved to be revealing of a few heuristics one might like to know when embarking on such a search. So... can you find it? Can you find the place in the New York Times where I was quoted a few years ago? It's been a fascinating week. I'm in Hyderabad, India to teach classes at Google on "How to Search." I know that sounds odd, but that's what's making this hugely fascinating. Turns out that there's a lot to learn about search, even if you work at Google. So I'm here, teaching my fellow Indian Googlers how to be better at search. The challenge this week comes from a Googler who wanted to find pictures of men and women in a "standard pose, facing forward, on a white background." That is, just standing there, looking at the camera. Initially I thought this was incredibly hard. HOW are you going to describe that ("standard pose...") to a search engine? You then search down a few pages until you find an image that's pretty much what you're searching for... in this case, the man standing on the white background in the lower right. Step 2: See that little blue link below the image of the business man? That lets you Find Similar Images... that is, ones that look a lot like this! As you can see, this works perfectly for the search I'm trying to do. 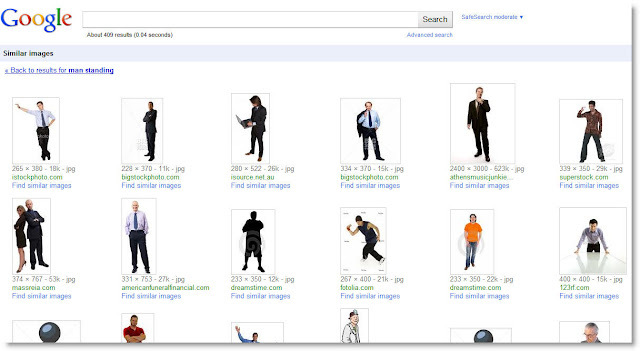 With "Find similar images" searches that were previously impossible now become practical... even fast. Check it out on an image you'd like to see multiples of. Some great examples: Find 5 different photos of the uncompleted Eiffel Tower. Find 10 different images of a red rose. Or 30 different Venn diagrams. Once you get the hang of it, this will be a tactic to remember!